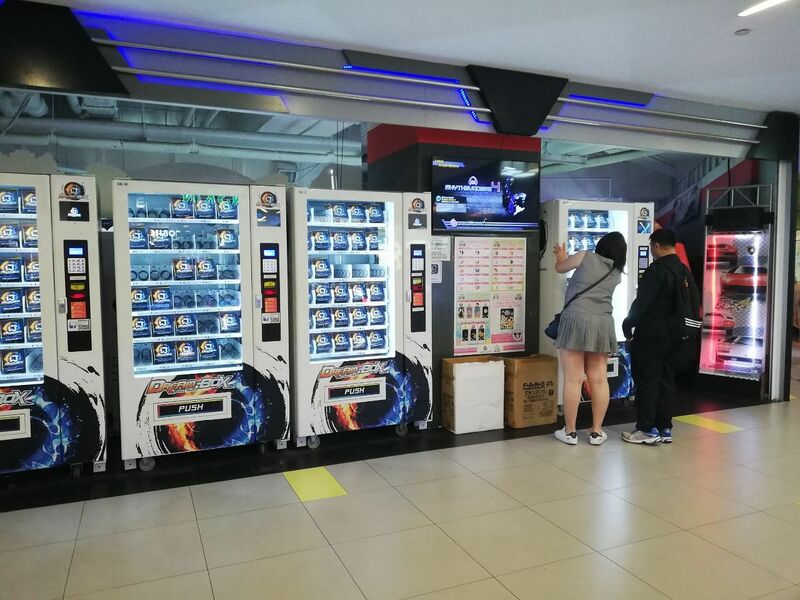 SINGAPORE - Vending machines offering "mystery" prizes may soon be a thing of the past, after the police issued a public advisory against them on Thursday (Aug 16). In a statement, the police said they are aware some merchants are operating such machines in public areas, which dispense random prizes upon receipt of payments in cash. "As this is a form of public lottery, it is an offence under Section 5(a) of the Common Gaming Houses Act," they added. Those found guilty face a prison term not exceeding five years, and are also liable to be fined an amount not less than $20,000 and not more than $200,000. The number of such vending machines in Singapore has grown, with at least four operators setting up shop across the island in the last year. Typically found in shopping malls, they usually charge between $5 and $10 for a “mystery box” containing a prize. While the boxes usually contain low-value items, such as coin pouches or USB chargers, vending machine operators often claim that big prizes such as smartphones or gaming consoles are there to be won. Among the earliest to set the trend here was hypermarket Giant, which launched its own “mystery box” machines as part of its VendMart vending clusters at its Tampines and IMM outlets in October 2017. For $10 a pop, the opaque machines would dispense vouchers for a surprise item worth a higher value, such as household appliances and kitchen gadgets. In response to queries, a Giant spokesman said that the two machines ceased operations in December last year. Similar machines operated by third-party vendors at several of its outlets will be removed from the shop premises by the end of the day, the spokesman said. Operators that The Straits Times spoke to said they were surprised by the news. Unlike gambling, they argued, there is no chance of people walking away empty-handed, and the items dispensed from their machines are of equal or higher value than the amount paid. Mr Brien Chua, who co-founded Gashapon Box four months ago with 13 machines, including four in Giant hypermarts, said that he discovered his business was illegal only after hearing the news on Thursday. “This has been happening in places like Taiwan and Malaysia for the longest time, we thought we were catching on to the fad and we’ve invested more than $100,000 in this,” said Mr Chua, who added that the firm had been looking to expand with more locations. For $5, the machines dispense items ranging from keychains to power banks, as well as “grand prizes” such as PlayStation consoles or drones. The chance of winning top prizes stands at about 3 per cent, he said. Gashapon is named after the Japanese capsule machines which dispense random toys and trinkets. “This type of machine is a long-term business where returns come in slowly... we’ve already invested in buying the machines and paid rental so we’ll have to figure out what to do now,” said Mr Chua, 37. Ms Rebecca Chan, who started Hey Box five months ago, said that she was contacted by the police on Tuesday, and all 15 of its machines have since ceased operations. “We were all caught by surprise... these machines have been around for a while and are common in other countries. We’re selling items, just in a different way. For example, if I sell a cable for $10, which is the retail value, it cost us less and we earn from the difference,” said Ms Chan, 28. She pointed out that online retailers also sell mystery boxes. Lucky Treasure, which has four machines in malls like Bugis Cube, is also tied down with rental contracts, said its owner, who gave his name only as Mr Loh. Other forms of vending machines, such as claw machines at arcades, in which players pay a fee for a chance to grab prizes with a claw, are still legal, the police clarified. This is because players can see the prizes. Takara Box, which lists seven locations on its Instagram account, could not be reached. A post on its Facebook page said that it is undergoing “an upgrading of service”, and will return with a new concept. When ST visited the Virtualand arcade at Nex mall in Serangoon on Thursday afternoon, several “mystery box” machines were still operational. The arcade’s duty manager said that she was unaware that the machines are now illegal. Ms Sherryll Lim, who had a go at the Takara Box in Liang Court in June, said that the $5 she spent on an eye mask was probably a waste of money. “Personally, I think it is just a gimmick, I just played for fun," said Ms Lim, 38, who is unemployed. "Maybe some people try to win the big prize and keep playing like they’re addicted, but I also see adults spending an hour at those soft toy machines... it’s just human greed or that desire to win."